The Quality Inn and Suites of Newberry Michigan invites you to explore our wonderful attractions and activities throughout Michigan's Upper Peninsula. Here you will find many within an hour of our location. The Moose Capital of Michigan invites you to experience all the fun and exiting attractions within one hour of our location. Browse our incredible Newberry Michigan Atractions below to learn more about your next great vacation in the Upper Peninsula! 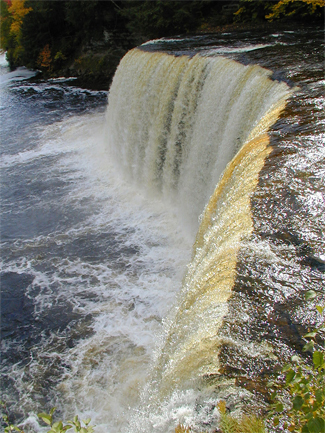 Within the state park you will find the Upper and Lower Tahquamenon Falls and many activities such as birding, fishing, hiking, sight-seeing, camping, snowmobiling, cross-country skiing, and more. 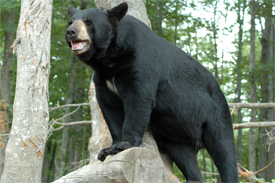 The areas wildlife abound and by chance you may see black bear, whitetail deer, moose, and other wildlife. The Upper Falls, one of the largest waterfalls east of the Mississippi has a drop of nearly 50 feet, more than 200 feet across and a water flow of more than 50,000 gallons per second. This complex is the Largest (bear only) Bear Ranch in the entire United States! We are found only in the Wild Upper Peninsula of Michigan. Just 20 minutes south of Tahquamenon Falls, or from Newberry go 4 miles north on M-123 towards Tahquamenon Falls. The TOONERVILLE TROLLEY, an authentic narrow gauge railroad, takes you 5 1/2 miles through thick forest, the habitat of bear, deer, moose, gray wolf, and many types of birds. 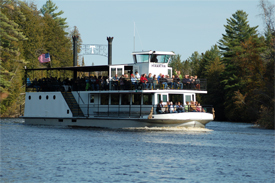 At the end of the train line is your first view of the beautiful Tahquamenon River, where the riverboat is boarded for a 21 mile cruise down the river to the rapids 1/2 mile above the Upper Tahquamenon Falls. The Seney National Wildlife Refuge is comprised of 95,212 acres of wilderness, swamps, islands, and lakes. 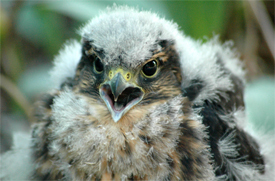 Animals abound and thrive within the safe haven of this refuge. Beautiful Trumpeter Swans, osprey, deer, loons, moose, deer, turtles, geese, fish, eagles, and more will welcome your visit! The Tahquamenon Logging Museum and Nature Study, located just 1 1/2 miles North of Newberry Michigan, invites you to come to their museum and park to explore the original buildings and memorabilia from lumberjack days of the past. Come and see the original C.C.C. buildings full of old photos, models and original logging equipment. Eat a real lumberjack's breakfast in the Authentic Cookshack made over a wood stove with home made care and goodness. Stroll along the boardwalk and nature trail and see part of the Tahquamenon Forest. The Tahquamenon River is nestled along this beautiful trail, where blue herons, ducks, birds and other wildlife abound. A golf course of unique variety for all levels of golfers located right across the road from the Quality Inn & Suites. This Upper Peninsula Golf Course is situated on 200 pristine acres. It has been redesigned with new bunkers, lengthened holes and new tee boxes, thus adding length to the entire course. There will be a brand new clubhouse, featuring: bar, restaurant, pro shop, and locker access which is available year round. Also, the club will now be able to host parties of all sizes for company functions, weddings, birthdays and class reunions. The Crisp Point Lighthouse of Paradise Michigan is one of five Lake Superior U.S. Life-Saving Service Stations along the coast between Munising and Whitefish Point. It is located about fourteen miles west of Whitefish Point. What a unique opportunity - Sled Dog Tours and Rides! Enter the world of Sled Dogs - feel the adventure and teamwork that will excite young and old! Click the Nature's Kennel title above to learn more! Multicolored sandstone cliffs, beaches, sand dunes, waterfalls, inland lakes, wildlife and the forest of the Lake Superior shoreline beckon visitors to explore this 73,000+ acre park. Located in the center of the Upper Peninsula, visit this site for more details. The Soo Locks have been referred to as one of the great wonders of the world and it is still the largest waterway traffic system on earth. Enjoy riding through the Soo Locks and navigating in the St. Mary’s River. Horses, History & Hospitality - Mackinac Island is nestled in the straits of Mackinac where the upper and lower peninsulas of Michigan meet. American, Great Lakes and Michigan history is rich on the Island, from military to commerce to the who's who of days gone by, everyone will enjoy the opportunity to enrich themselves while visiting Mackinac Island. The five-mile bridge, including approaches, and the world's longest suspension bridge between cable anchorages, had been designed by the great engineer Dr. David B. Steinman. Click here for map of the Two Hearted River - Legendary river from the author Earnest Hemmingway! It's a beautiful river that has been designated as one of Michigan's Wild Rivers. Click here for map of the Fox River - This great river system is located in Alger, Schoolcraft and Luce counties. The basin is aprox 26 miles long.